This article first appeared in The Edge Malaysia Weekly, on April 16, 2018 - April 22, 2018. ONCE stock market darlings, tobacco companies in Malaysia have seen their fortunes tumble since 2015. And most troubling of all? There is no bottom in sight. Certainly, their future in Malaysia is in question as they continue to lose ground to their illegal counterparts. Following numerous excise tax increases from 2013 to 2015, the price gap between legal and illegal cigarettes has grown so wide that a 20-pack of legal cigarettes now costs four times as much as illegal ones. According to Nielsen Malaysia’s 2014 Illicit Cigarette Study, illegal cigarette incidence then stood at 33.7% of the total market. Last year, the figure was 55.6%. This means that one in every two cigarette packs sold in the country is illicit. The situation has become so bad that the two major tobacco companies — British American Tobacco (Malaysia) Bhd (BAT Malaysia) and JT International Bhd (JTI Malaysia) — have shut down their manufacturing plants here to cut costs as they are selling fewer cigarettes. And things could get much worse, says JTI Malaysia managing director Guilherme Silva. “Next year, this figure could go up to 58% and the following year, 60%. We are not headed in the right direction. Actually, the situation is getting worse every year,” he tells The Edge in an interview. 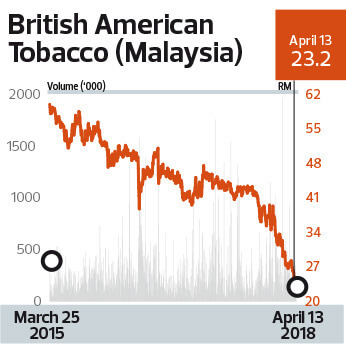 The impact is most apparent on BAT Malaysia as it is the country’s only public-listed tobacco company. JTI Malaysia went private in June 2014 when it was purchased by its controlling shareholder, Japan Tobacco Inc. BAT Malaysia reported a 34% year-on-year drop in net profit to RM479.69 million in the financial year ended Dec 31, 2017 (FY2017) — its lowest since FY2000. Revenue dropped 20% to RM3 billion. “How could we as a legal company not be impacted by the black cigarette market … when more than half of the market has shifted to illegal consumption? And to date, [that] is still not addressed. This has obviously put significant pressure on our operating results for the second year in a row in spite of our gradual share growth and stable volume trend in 2017,” says its managing director Erik Stoel in an email reply to The Edge. Stoel notes that shareholders of BAT Malaysia have lost a hefty 58% of their investment value since the last excise increase of 40% in November 2015, which was aimed at reducing smoking in Malaysia. BAT Malaysia shares closed at RM23.20 last Friday, giving it a market capitalisation of RM6.6 billion. The stock was at RM64 on Jan 2, 2015. Still, BAT Malaysia remains the market leader, with a 54% share in 2017, and its brand Dunhill continues to dominate the premium segment. JTI Malaysia suffers the same fate. Silva says sales volume of its cigarettes slid a further 9% last year. In 2016, it fell 25%. However, the company’s share of the domestic cigarette market grew by a marginal 0.8% last year. “We are doing better than years before but the industry is still getting smaller. For us, our profits are less than half of what we used to get two years ago,” he adds. He expects a 5% to 10% drop in sales volume this year. Based on the latest information obtained from the Companies Commission of Malaysia, JTI Malaysia’s annual revenue and net profit have been declining since the financial year ended Dec 31, 2015 (FY2015). It posted an 18.2% year-on-year decline in net profit to RM102.28 million for FY2016, from RM125.01 million the previous year, while revenue fell 7.3% to RM1.3 billion in FY2016 from RM1.41 billion in FY2015. The World Health Organization (WHO) and health authorities around the world believe raising taxes on cigarettes can discourage smoking. In the case of Malaysia, the current average retail price for a cigarette pack is RM15.50, of which RM8 is tax. So, the country’s current tobacco tax level works out to be 52% of the retail price, still lower than the 75% recommended by WHO. However, recent studies show that cigarette consumption is still on the rise despite the tax increases. A National Health and Morbidity Survey in 2015 showed that five million Malaysians were smokers, up 6% from the 4.7 million recorded by the Global Adult Tobacco Survey Malaysia 2011. “The reality today is that total cigarette consumption has not fallen as demand continues to be fuelled by cheap illegal cigarettes. Being a public-listed company with huge investors, we are often asked by our shareholders and other stakeholders how this huge illegal cigarette problem — which is impacting their investments — will be addressed,” says Stoel. It is not for lack of trying. The Royal Malaysian Customs Department has been stepping up enforcement efforts to stop the inflow of illicit cigarettes. Customs director-general Datuk Seri Subromaniam Tholasy tells The Edge the department seized contraband cigarettes worth RM1 billion in taxes last year. This year, he expects the numbers to be good too. “We will suspend the licence of any freight forwarders that are caught bringing in illicit cigarettes even though they claim innocence. The department recently suspended the services of 31 forwarding agents (for this offence),” he notes. Still, the Customs Department is struggling to keep pace with the rapid increase in illicit cigarette trade. In the meantime, the problem is costing the government RM5 billion in lost tax revenue per year based on Nielsen Malaysia’s finding that 55.6% of all cigarettes consumed in Malaysia were illicit last year. “We often hear that addressing illegal cigarettes is the Customs Department’s responsibility and should be dealt through enforcement. The truth is, illegal cigarettes currently are too big for a single enforcement agency to address,” says Stoel. “Like what was said by Guna Selan Marian, ex-senior enforcement officer of the Ministry of Domestic Trade, Cooperatives and Consumerism, during the recent Global Illegal Trade Summit, ‘Billion-ringgit contraband trade can end only if government agencies work as one. Expecting only the Customs to fight the menace is expecting the impossible.’ We agree with him totally,” he adds. Stoel points out that the Customs Department has the power to take action against illegal operators because they have not paid taxes on their illegal packs. “Similarly, we have laws that require cigarette packs to be labelled with graphic health warnings, not sold below a minimum price and not have tar and nicotine content above a certain limit … these are laws under the Ministry of Health (MoH). The legal industry complies, but there are hundreds of millions of such packs out there which do not comply and are freely sold. “So, the question is why are such laws imposed and enforced against only 40% of the market (legal) and not 60% (illegal market)?” asks Stoel. JTI Malaysia’s Silva concurs. “A lot of times, when we talk to MoH, they would say, ‘Illicit cigarettes is a problem of the Customs Department’. We don’t agree with that. It is a Malaysian problem. It is a national problem. So, we should definitely have help from Customs, MoH, maritime police and regular police as well. We need to move from this mentality that the problem is next door,” he says. Since July last year, major tobacco companies including BAT Malaysia and JTI Malaysia have been engaging with the government to bring back the sale of cigarettes in packs of 10 in a bid to narrow the price gap between legal and illegal cigarettes. However, the negotiations have hit a brick wall. Minister of Health Dr S Subramaniam has given a resounding “no” to the proposed plan, saying smaller packs could lead to an increase in cigarette consumption; therefore the current ban on smaller packs since 2010 stays. “We understand that the minister is having it tough in responding to the increasing consumption of cigarettes in Malaysia and he doesn’t like the smaller pack proposal, but we haven’t seen any other proposal from his ministry to help tackle the illicit cigarette trade problem,” says Silva. 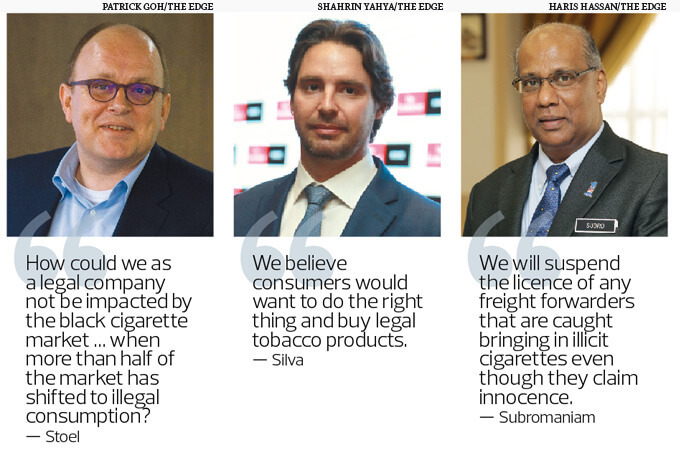 Indeed, Silva feels that the legal tobacco players’ intentions backfired after they unveiled the smaller pack plan. “The legal industry felt more scrutinised by MoH after the discussion on smaller packs. And this puzzles me because here, you are going after the legal industry that is trying to find a solution, and not going after the illegal industry, which is actually the problem. And that is very frustrating. We went to talk to the lawmakers with a clean proposal and it almost felt like we got punished for it,” he explains. Silva has not given up on the quest to bring back smaller packs as he believes things are just at a standstill right now. “We are not asking to pay less tax or to make our cigarettes cheaper, they are just going to be charged less for a smaller amount. “We also believe consumers would want to do the right thing and buy legal tobacco products. If they are given an opportunity to choose between buying a legal 10-stick cigarette pack for about RM6 and an illegal 20-stick pack being sold at RM4 to RM5, I am very confident 15% to 20% of consumers who have downgraded to buying illegal illicit cigarettes would return to legal products,” he says. A glimmer of hope has emerged, though. Deputy Minister of Finance Datuk Othman Aziz was reported as saying on March 29 that the government was still considering the smaller pack proposal and studying the impact of its implementation so that it will be in line with Malaysia’s commitment as a signatory to the WHO Framework Convention on Tobacco Control. “We do understand the position the government is taking because it is a controversial theme, but, hopefully, they will pick it up after the elections because the problem is getting worse,” says Silva. “But smaller packs alone won’t solve the problem too. You need both enforcement and smaller packs to have a better chance of succeeding. The problem has become too big. There is no silver bullet (that’s going to fix the problem). You need all of them,” he adds. BAT Malaysia’s Stoel says there is a misconception that small packs will only fuel smoking but the ignored reality is that illegal cigarettes are already doing that job very well. “Small packs are a proposal to uplift those smoking illegal cigarettes to legal ones by giving them an alternative they can afford. In markets where affordability is the main driver of illegal consumption, we need to be open to considering pragmatic solutions that can bring back control instead of closing our eyes to 60% of the reality. As such, it is good to note that the small pack solution is still under consideration by the government,” he adds. To combat illegal products, JTI Malaysia began selling a new low-priced brand called LD last September. Priced at RM11.50 for a pack of 20 cigarettes, they are believed to be the cheapest on the legal market. However, Silva says the company is only breaking even with the new product. “It is a very low-margin product. The new brand has attracted some consumers, but it hasn’t gained enough traction to compensate for the loss of consumers who have shifted to illegal cigarettes. Following our story, Philip Morris Malaysia Sdn Bhd (PMM) sent The Edge the following statement on Tuesday (April 17) to say that it does not support the proposal for the reintroduction of smaller cigarette packs as there is no evidence that it has been effective in curbing illicit cigarette trade. "On the proposal to reintroduce 10-stick packs, PMM does not support it since there is no evidence that it will have any positive impact in curbing illicit cigarettes. Instead, the protracted debate has already resulted in the appearance of illicit 10-stick packs in the market," a PMM spokesperson tells The Edge. "At the same time, PMM is very encouraged by the ongoing enforcement efforts of the government to combat illicit cigarettes and stresses that 10-stick pack proposal will only distract and dilute these efforts, " the spokesperson added.